Thanks for the diaper rash trick btw. I LOVE coconut oil. Such a shame it's not as easy to get in the UK. I am obsessed with coconut oil! Love this post :) I love roasting my veggies in it. My favorite is roasting cherry tomatoes in coconut oil and chili flakes. You can add them to ANYTHING! my friend sent me some a few weeks back and after reading this post i am over the moon in love with all of it's uses! so far i've used it in place of oil in banana bread and apple granola. i love the consistency. I use it on my skin (whole body + face, amazing). I used it to fade any stretchmarks. I use it on my nails, cuticles. I use it to prolong the softness of my feet after a pedi. This is a crazy one, and my sister says I'm taking the "hippy stuff too far" but it works for me! i tried switching to an all natural deodorant and it gave me a rash. I've been using coconut oil forever as a lotion so i gave my pits a break and just put coconut oil on to help heal the rash. Well it worked better at "deodorizing" than the all natural rash inducing stuff, even through workouts! Since I am about to have a baby and will be breastfeeding...how should I ingest the 3 1/2 tablespoons?? Do you put it in a smoothie everyday or on toast? What do you think is best. I used coconut oil for my 2 1/2 yr old who suffers from Keratosis Pilaris it doesnt cure it but it helps a lot with the appearance. This is so funny. My mother in law bombarded us with coconut oil after Mila was born. Matt was like...what's with all of the coconut oil??? Haha. It's such an amazing thing though! Definitely used it when Mila burned herself on a slide. No scar! I've always used it as a moisturizer all over after my shower. Smells divine! Especially in the summer! I've read that you should be careful ingesting it daily because of fat/cholesterol. That is what's stopping me from eating it everyday. Also - does it matter about organic, virgin, etc, etc, etc? I got a jar a month or so ago and was trying it on the backs of my arms for those stupid little bumps. Glad to see all these other uses. The diaper rash one is super good to know. And I had no idea you could do a straight swap with butter. Can it take high temps for things like stir-frying? i'm actually trying NOT to cook with oil, since it's 100% fat and contains no real nutrients (: i'm finding it rather easy, really..
My sister is in the Peace Corps and lives in Panama on a remote stretch of land jutting into the Caribbean. All the indigenous people use coconut oil all the time for EVERYTHING (many of which you mentioned) so, when my sister visited in July she brought me a jar of it that was made by the natives in her village. She raved about it but there it sits in the cabinet under my bathroom sink, untouched and unused. But now that I've heard even MORE about it... I think I'll dig it out. I won't be cooking with it (obviously ;) but I'll definitely use it on my face and scalp! I have been using it for acne!!! Seems to help over night! Ooooh, so trying this for the BF benefits! I do use coconut oil instead of butter in baking now so I don't have to forgo all baked goods :) I actually prefer it, but then again I've always loved coconut. My baked goods have passed the hubby test though and he hates coconut, so it's just subtle enough. Oooh! I had no idea! I heard it was good for baking, hair and skin but did NOT realize all these other uses! Thank you. Who knew? Thanks for the awesome tip! I used it as a lotion when I was pregnant of my first child and I fell in love with it. I am expecting twins now and coconut oil is all over my body!! I'd love to use this for my puffy eyes! I'm almost out of what I usually use and then I could use the coconut oil for all of these other things too! Holy coconut oil! Had no idea it had all these uses AND I'm with you I believe walla is a word too! Need to grab these ingrediants next time I am at the health store. Love that it doesn't call for alot of stuff! I didn't know I could do this much with it! I've heard many benefits of coconut oil, and some of the ones you shared are so new to me! I've only cooked with it and love it in oatmeal and roasted veggies, but I have got to try it on my hair ASAP! Wow! I had no idea about all of these things you can use coconut oil for! Hi, I want to thank you for this post. After reading it and doing some more research I decided to use coconut oil on my baby. (She has dry skin patches and red areas in her folds.) I have massaged unrefined, organic CO on her a few times a day for 2 days now and she has much improved. I will keep it up for sure! Thanks again from my softer, happier, coconut-smelling baby!! yes, for acne! loving it! I've never seen coconut oil here! Is it expensive? I'll have to go on the hunt for it, I'm always looking for natural hair treatments. WOW! So many great benefits! I'm try to make healthier changes and I think I need to start using this! Do you have a preferred brand you use?? It is actually pronounced "Voila", americans just mispronounce it. I too use it as a moisturizer, especially on my face (2x a day). An added bonus: I have my nose pierced and every few weeks or so a bump would form around the piercing. It wasn't a keloid as it would go away after a few days. But it was ugly and big. Since using coconut oil, I've never had another one! I also like to use it has a moisturizing hair mask. I saturate my hair for about an hour before I shower, then wash and conditioner as usual. Leaves my hair silky and soft without being oily or weighed down. Works great for burns like you and others have said. Mine healed quickly and without a scar! I'm actually speak french, and "voila'' means ''here or there it is''. Kind of an expression. I use inhalers for my lungs which cause a thrush or yeast in my mouth. Coconut oil relieves some of the pain caused by this medication. I also read that swishing coconut oil for 15 minutes will pull toxins from the body. Can you use this for psoriasis? And how much should you use to help it? I use coconut oil on my skin from head to toe and also as a deep conditioner. Another amzing oil is almond oil. I switch between that and coconut oil.....love them both! As far as hair growth....I haven't noticed anything with the coconut oil, I guess I just wasn't paying much attention. However, after looking up almond oil and seeing that promotes hair growth, I started putting it on my lash line twice a day....AND MY LASHES GREW!!!! I have been reading about the wonderful benefits of coconut oil for the past few months. I suffer from thyroid and skin allergies, depression, overweight. So the benefits of just consuming 2 tbs of coconut oil a day to help with my conditions is just awesome. I received Nutiva organic extra virgin coconut oil and some Braggs ACV and all I can say is I am like a kid in a candy store. I been using it these past 2 days and although it is too soon to say much about the 2, I have noticied that my mood has stayed in a more "mellow" mode and my face is glowing!! No more dryness and flaking of the skin and no dry feeling hair.. As soon as I get out the shower and dry off I use the coconut oil from head to toe and eat a tbs of it.. The coconut oil is a bet yucky to handle, but for the greater good I do little by little until I get use to it. As far as the ACV, I'm doing a ACV and Lemon cocktail since I have a lemon tree. I hope to see more improvements very soon because although I am only going on 30 I feel 50!! Walla is a word, that means either: a sound effect imitating the murmur of a crowd in the background. Or it is an Arab word representing a sense of wonder. Most of the times it is used as a question. So you are right, but I still think you mean Voila! (the French word). :) I love your blog by the way. Can't stop reading it. Please post more paleo recipes. I tried your snickerdoodles last night and they were the BOMB! I mixed some tea tree oil with coconut oil and use it as a night time face moisturizer. Love it! I think I will try some of the other tricks I've read here. Thanks! 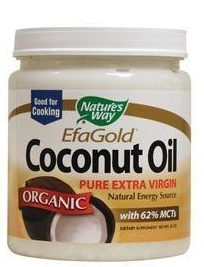 In the Philippines, a tablespoon of pure virgin coconut oil is taken orally for an added energy boost. I must say, it is great to go organic and you really can feel the difference. Argan oil in Australia is also a hit because of its cosmetic benefits. Coconut oil is awesome! I use in in really good stir-frys, as a face wash (great for acne), as an all body moisturizer. Coconut oil is always good for the skin and is always a good remedy for facial skin care. Extra virgin coconut oil is better though. I have a lot of digestion and gut issues. Coconut oil, milk and the meat of the nut all help ease my stomach. Coconut oil needs to be raw NONhydrogenated. It is not as bad for you as some may think in cooking. My husband's cardiologist recommended it after my husband had open heart surgery. He did stress the raw NON hydrogenated part. It is a medium chain triglyceride (MCT) as opposed to ling chain triglyceride (LCT) as in olive oil and other cooking oils/fats. Since it is a MCT our bodies metabolize it differerently and does not store it as so much fat as it does with LCTs. I know this comment is MONTHS late, but your blog is new to me! I LOVE coconut oil... I put it in coffee and cook with it and use it for face moisturizer, and my MIL just told me if one puts a bit around the nostril, it can help prevent getting sick! Very good stuff! My comment is months late also but I wanted to ask a question. I ordered organic coconut oil from Vitacost and after I opened it and used some the pkg. said to refridgerate, which I did but now it's hard as a brick. Do you refridgerate yours? I use coconut oil as one of the bases in the homemade diaper cream I made for my son. It rocks! When I first came across a few recipes for using it in diaper rash cream back when he was about 6 months old, I was rather skeptical because I didn't believe it would work like the whole professionally made stuff would. I also use this while cooking too! It melts at a lower temperature and honestly, I find myself using so little as to compared to when I was using canola oil or anything along those lines. It also gives our food a bit of a sweeter taste without being loaded down with extra additives. My hubby also LOVES using this as his after shave! He says it makes his skin feel better and he says it doesn't seem to clog his pores like the other stuff that's made. In American radio, film, television, and video games, walla is a sound effect imitating the murmur of a crowd in the background. A group of actors brought together in the post-production stage of film production to create this murmur is known as a walla group. According to one story, walla received its name during the early days of radio, when it was discovered that having several people repeat the sound walla in the background was sufficient to mimic the indistinct chatter of a crowd. I love popping popcorn in it. Give the popcorn a great flavor...some brands more than others. I MAKE my own coconut oil, been making it for years now and I haven't bought ANY other kind of oil for my needs. I cook with it, I bake with it, yes, even cakes and all my other desserts. We love the "leftover" pulp, or we dip it out before it gets brown and use it as a spread. DELICIOUS! I have to refrigerate mine because if I don't, it will go rancid; I think that's due to the bit of water left, especially in the cold pressed virgin kind. I don't heat mine that much, but I must, since I don't have the equipment to do it otherwise, but once in a while, I get the cold pressed kind. So beautiful to see the lagoon of pure oil! I live in the tropics and have hundreds of coconuts all the time. when we design new tattoos designs on the body coconut oil is best oil used as a medicine for it . People. She knows what Walla is. She knows what Voila is, too. It is called humor. I've recently bought the coconut oil in the local organic store. The cashier told me I can spread it on the bread and eat it as a bread and butter. I also tasted it there- it was great. After that I ate it with some more roll, not much. And...After few hours I've got terrible stomach pain for few hours! Terrible feeling! It was sure from this. So I've got such experience with this oil. After that I decided to use it externally only. Did somebody get also similar experience? I have been using cocnut oil now for about 3 months,I use it all over every night ..From the top of my head (my hair the ends) to my feet.Just love it.I have actually noticed on my neck that the loseness of the skin due to aging has tighted up and does not look as loose feels better also softer,my hands dont have that creapy look on the skin since iam using cocnut oil...My fave feels and looks way better.I will never stop using it..Iam 59 and the neck and hands have me convinced that it does work...And i am a sun person..And this is the best my skin has looked in a few yrs as i am getting older...Iam stoked about cocnut oil..I drink 1 can of cocnut water every day also,and have done it for yrs..
A friend introduced Trader Joe's coconut oil to me. She said it was cheap...i had never bought it anywhere so? I bought some really cheap coconut oil at Walmart, but after having a taste of Trader Joe's again with my coffee at a friend's this week, I'll be getting the TJ's brand again. Just one tbsp made my coffee super-yummy. The same friend who introduced me to it told me that she makes a coffee beverage in her blender with this to get her daily intake of good fats: a couple of spoons (go by chart here and break it up between a few cups) of coconut oil, a tsp or so of butter, honey to taste, blended in a blender makes it very frothy like a latté. I also have a tiny canister of coconut oil + baking soda on my bathroom counter for brushing my teeth and my children's teeth. I'm not sure if my hubby has used it, but I just read an article saying plain coconut oil is a really good toothpaste after I've been doing it a couple of months. I would do the oil pulling, but I rarely have time, so I just brush with it. I really like the deodorant idea. Sounds very healthy and adequate as well. With coffee, in a blender or not, also with butter and honey but if using these in addition to coconut oil, definitely in the blender for a homemade latté. As toothpaste I've mixed it with baking soda, but plain is very beneficial, too. For those who experienced stomach pain after ingesting CO...I has the same thing happen after I ate a TBLspoon full. I think, for me, it is because I had my gall bladder removed and excess oil or fats makes me sick. I use enzymes with ox bile or bile salts to prevent problems if I ingest fatty foods and it usually works. If you still have your gall bladder and experience problems, it very probable you have gall stones, bile duct or pancreatic problems and just don't know it yet. I read somewhere that one shouldn't ingest coconut oil on an empty stomach. It will cause upset. I love Trader Joes CO. I have very dry and sensitive skin I have always suffered from razor rash and ingrown hairs. I made a shaving cream using CO, Olive Oil, Bee's Wax, and Baking Soda, My underarms have not broke out at all since I started using it, and my legs feel wonderful and moisturized. My boyfriend use's it when he shaves in the shower, and loves it. I also made a sugar scrub using CO, white sugar, lemon zest and juice. It was to die for...OMG, it made my skin so increditibily soft and smooth. Only down fall was later that day my shower was invaded by 10 billion ants...lol May have to try replacing the sugar with salt for next time. I love your blog! I TBSP of Coconut Oil in your mouth and swish! 10 to 20 mins. Don't SWALLOW! Spit into Paper Towel or Toilet. It will Remove Toxins from your Body, and WHITENS TEETH, and FRESHENS BREATH! Helps the SkIn and Nails! from the Inside to Out ! My question is about calories. Coconut oil has about 120 calories per Tablespoon. You mentioned about breastfeeding mothers consuming 3.5 TBS of coconut oil per day. That's over 400 calories per day from oil. Won't that make you get fat? I use coconut oil for just about everything. Moisturizer, sunscreen, lotion, deodorant, toothpaste, oil pulling, hair conditioner, cooking, frying, baking, everything. It is so good for you. I put it in my coffee, I eat a spoonful daily. It gives me energy, helps me sleep and generally feel better and look better inside and out. It has cured my candida (daily use, oral, external and frozen suppository at bedtime) and has healed my husbands toenail fungus and athletes foot (daily use for several months to completely cure). Also just started using it on husband for rosacea (daily topical) and it is remarkably improving. Be sure to use organic, virgin, and cold pressed coconut oil. It is AWESOME. I use trader Joe's coconut oil as well! Looove it. I use it for a little highlight on my cheeks for the days I'm feeling a bit lazier. Also, I have eczema and use it to soothe my dry itchy skin! Every single night before bed. Love this stuff!